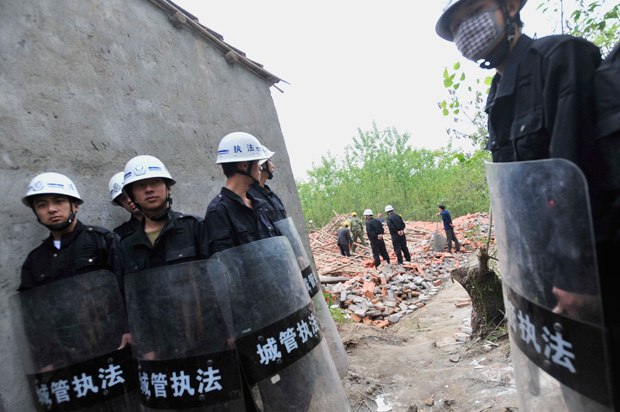 Chinese police with shields guard workers demolishing houses declared illegal in Wuhan, Hubei province in 2010. Land seizures gave rise to the term “nail house” to refer to the home of a holdout occupant refusing to sell to developers, likening them to a nail refusing to be hammered down. Ordinary people resisting eviction has resulted in numerous reported cases of violence. By Caixin staff reporter Luo Jieqi. This article was first published by Caixin. A village head and the boss of a building company were among the seven people arrested over an arson attack on a protest against a land seizure in Shandong Province in which one man died and three others were hurt. The government of Pingdu, a county in the eastern province of Shandong, said on March 26 that seven people have been arrested over the attack that occurred five days earlier. The county government, which made the announcement on Weibo, China's answer to Twitter, said those arrested included the heads of Dujiatuan Village and Guihe Property Co. The village is in Pingdu County. It said the pair instructed five others to torch a tent set up in protest on land at the center of a dispute. Four men were sleeping in the tent, which local reports have said was doused in gas in a nighttime attack. A villager named Geng Fulin, sixty-two, died in the blaze. Three others were injured, two of them critically. The government said on March 22 that an investigation determined the incident involved arson. The conflict in the rural village in Shandong has been repeated countless times across China in recent years. The deaths last year of three farmers in the inland provinces of Henan, Hubei, and Sichuan during protests over similar land seizures prompted action by the central government. In May, the Ministry of Land and Resources warned officials around the country to enforce rules against illegal land grabs. Yet the problem persists, largely because local governments depend on income from land transferred to developers. However, farmers complain they have little say in the process and do not get enough for the land they depend on for survival. There have been calls for reforms to let farmers sell or develop their plots, but for now they are limited to little more than tilling them. The Pingdu government did not provide the full names of the village head and building company boss. The village head had the surname Du, it said, and the contractor's surname is Cui. Guihe Property Co. is the contractor for a development planned on the parcel of land that covers nearly 270 hectares in Dujiatuan Village. The project, which is owned by Qingdao Chengyuan Tianye Property Development Co., involves the building of residential properties, a commercial complex, and entertainment facilities. Locals say village authorities secretly sold their farmland to developers in 2006 and told them only last year. They got little in return, they say. The villagers set up the tent on March 9 to try to slow the work of Guihe Property. Four village men would stay in the shelter each night. Unidentified people made trouble for those camping out one night, villagers said. The government of Pingdu County said on March 23 that the land transfer was approved by the provincial government and complied with the law. However, a Beijing lawyer named Yang Zaiming said the deal was illegal if villagers were not informed. Li Rongmao, a former employee of the Communist Party committee in Dujiatuan, said officials faked villagers' signatures so the land transfer could proceed without their knowledge. The committee is the ruling Communist Party's top authority in the village. Li also said that in August eight bulldozers destroyed all the cultivated fields on the land now in dispute. Caixin contacted Zhang Haishan, the Director of Land office of the Pingdu Land and Resources Bureau, and asked for documents about the requisition in Dujiatuan, but he declined to provide them.